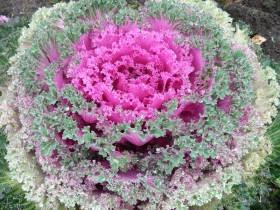 Ornamental Kale, seeds, reproduction, growing, care, examples of landscape design, photo and video. 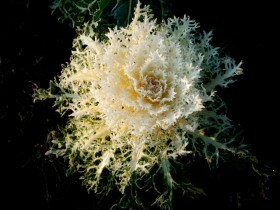 Ornamental Kale is almost indistinguishable from the roses. 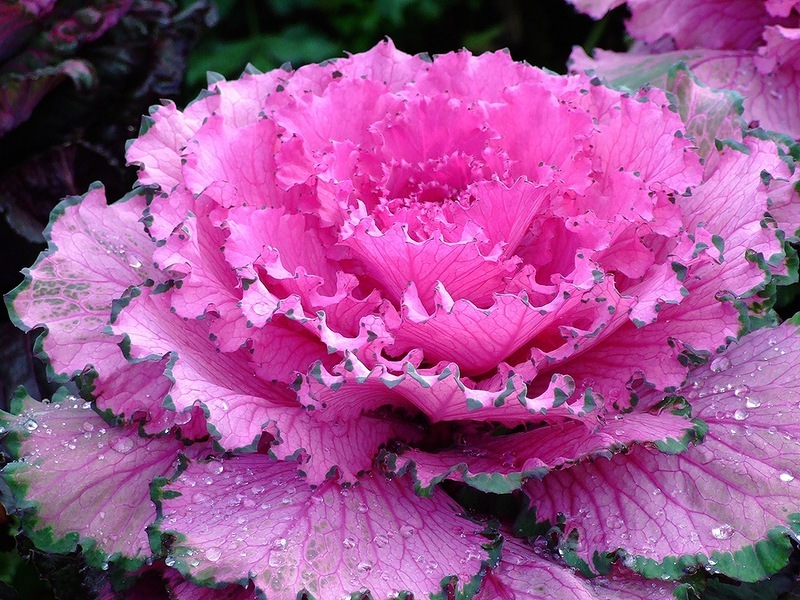 Unusual and very beautiful ornamental Kale – not only the decoration of private gardens, but many historical parks in European cities. The plant looks like a king, it will be the main on a bed, it is only important to correctly organize the location. Predecessor culture, wild cabbage, were cultivated in Ancient Greece as a fodder crop. 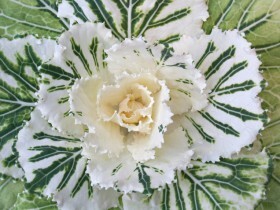 Bright leaves could not fail to attract the attention of the ancient gardeners, thanks to them, the cabbage has changed its purpose and became a decoration of courtyards and gardens. Even one such plant is able to decorate a pot or tub of small size, by the end of summer culture is replete with all the colors of the rainbow, it can be pink and pale yellow, Burgundy and purple. 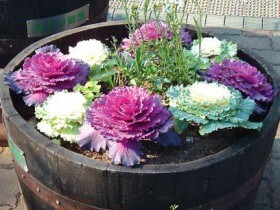 Its charm cabbage flower beds to keep the cold weather, light frosts are not a hindrance to them. 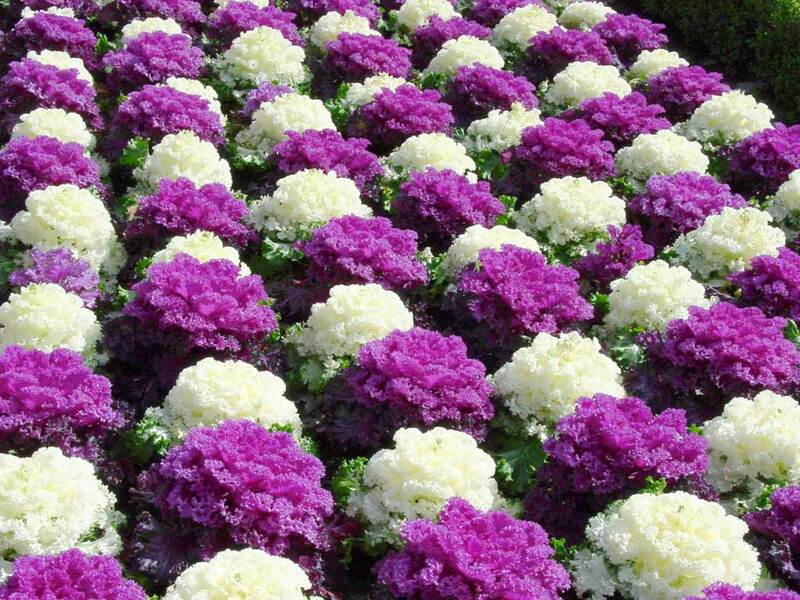 An exquisite combination of white with purple. Varieties of this plant is conventionally divided into two groups: with a loose head, which is like exotic flower, and no head. The first garden crops have been the breeders of Japan, many varieties have names, associated with the Country of the Rising Sun. Plants from the second group – most high, leaves of various shapes growing along the entire length of the stem, they can be removed and then the cabbage will be almost indistinguishable from rose.. With the purchase of any one variety and decide, what you want to get the result. The birthplace of the coast of Western Europe. Leaves – bare, color – dark purple or bluish-green. Derived forms with pink, white or purple socket, stem green with crimped edge. There are both undersized, and tall shape of this variety. Tall "the Language of the lark" is like a palm tree: the leaves grow on long stalks. Cabbage of medium height, leaves – grey-green. Middle-grade to 1,5 meters in height, foliated socket with drooping leaves. The color of the Bush – reddish-purple. The variety is resistant to bacterial, it tolerates low temperatures. Late variety, socket spreading, gray-green, turning into purple. Sheet wavy on the edge. The variety is resistant to low temperatures and biting pests. Cabbage prefers rich humus soil, sandy loam or. Responds well to irrigation, loosening, fertilizer nitrogen or organic fertilizers. Good, fertile soils are the two dressings at intervals of two weeks, on the poor you need to make four feeding. Breeds cabbage seeds, they appear in the second year of peduncle. To get your seeds, keep plants in winter, and then planted in the ground. The seeds ripen in pods. Below gardener was ahead of the birds, peduncles cover with gauze or a light cloth to protect. Yellowed and dried pods to cut, tie in a bundle, hang in a dry place on newspaper. Two weeks later, they will be revealed, seeds stored in paper bags or woven bags. Cabbage sow in March, in small pots, deep 1,5 cm, sprouts appear quickly, five days, temperature of germination – 18-20 degrees. The land for planting should be loose, sour, fertile, to obtain better soil mix turf or garden land with humus or peat. Seedlings can be planted directly into the ground or placed in a greenhouse. The ground around the plants is mulched with hay, wood chips or grass, such a cover conserves moisture and prevents weeds. The leaves of this cabbage are edible, it can be added to salads or canned for the winter. Young shoots stewed with potatoes. To get rid of the bitterness, plant freeze, before use and thawed. Cabbage ornaments made of plants of different colors. Planted in any capacity Kale can decorate a place of rest, gazebo, area for barbecue. Vases, wooden tubs, or ceramic pots have at the track, it will look original and solemnly. 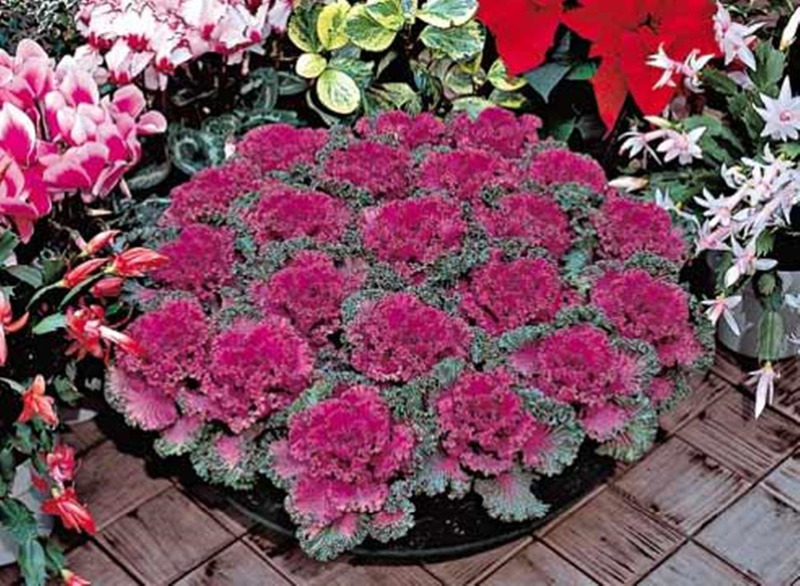 Depending on the size of the container, you can plant the plants of one color or several. Cabbage goes well with begonia, ivy. Plants in pots need in a timely fertilizing and watering, this is only possible in the case, if green thumb will almost always be on site. 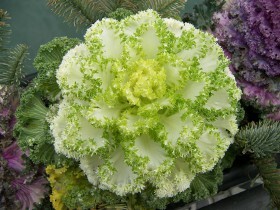 Ornamental Kale in a low vase. As the plant looks the most ornamental in late summer, until that time it can grow elsewhere, and then planted in a flower bed. Cabbage tolerates transplant, it is important to observe, the roots were "wrapped" in the ground, after the procedure, the culture is well watered. The plants are planted at some distance from each other, they're on the Sunny side, partial shade. 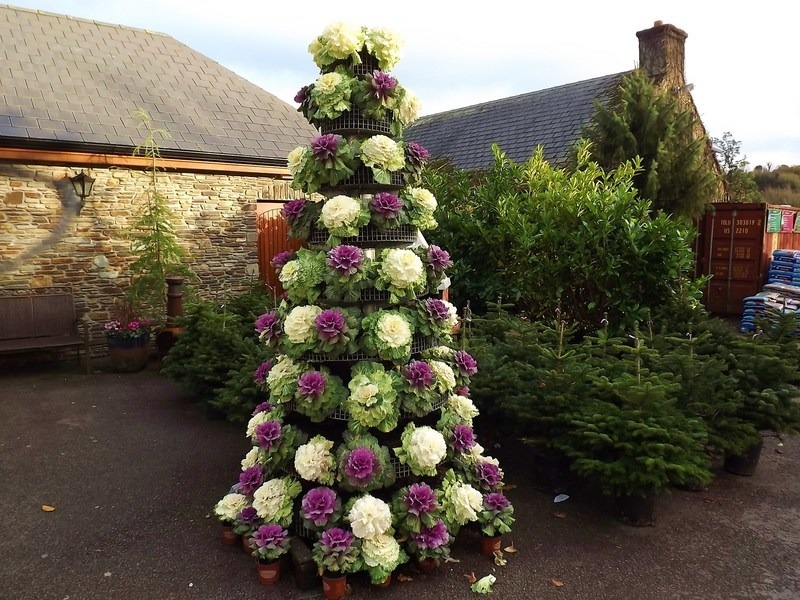 Vertical flower bed of ornamental cabbage. Ornamental Kale, planted along the tracks, repeats their outlines. 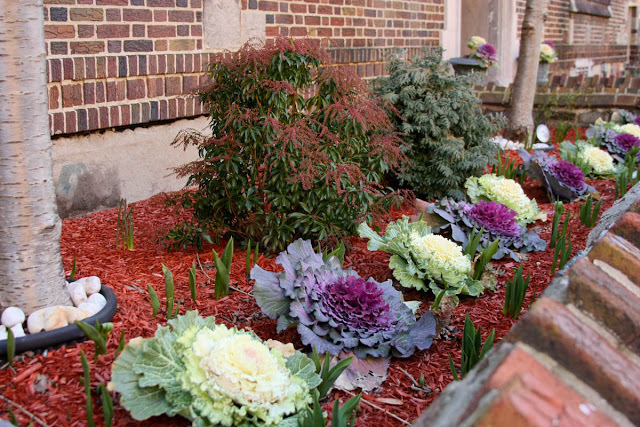 In autumn the plant can be put in place faded annuals, it will be pleasing to the cold weather. Upon the occurrence of frosts, the head can be cut and to keep the house in a vase for another month. Cabbage patch may look and so. 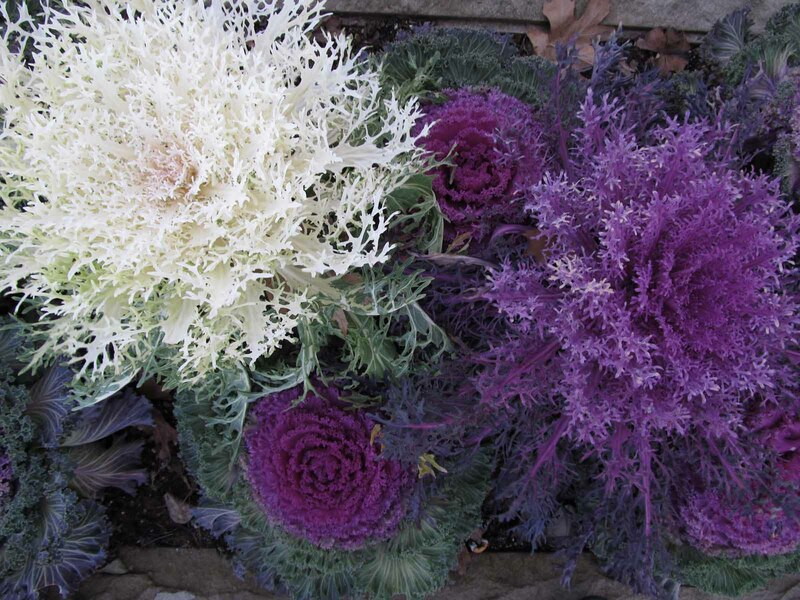 In wet weather ornamental Kale may be affected by slugs. The main pests are flea beetles and cabbage caterpillars. Fledgling plants insects are not dangerous, but young trees they eat with appetite. Flea beetles can deter ash, tobacco, red pepper, chopped means the plants after watering sprinkle. Slugs will help pour on the ground eggshell, needles. Butterflies-cabbage white good scare marigolds, planted between the bushes. 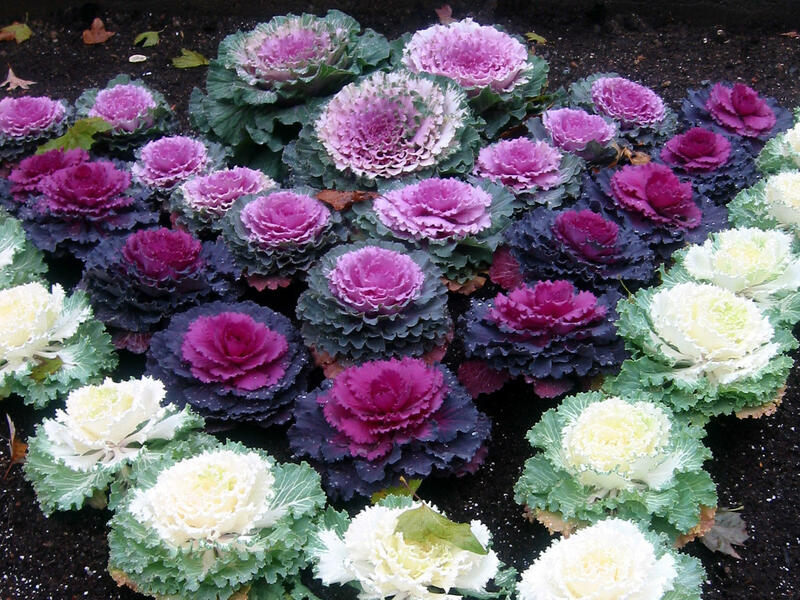 Ornamental Kale is quite popular among gardeners, it is easy to grow, and the appearance of the plants in the form of a huge "rose" and "trees" will give the area an unearthly look and will delight the gardener and his guests to the most snowfall. 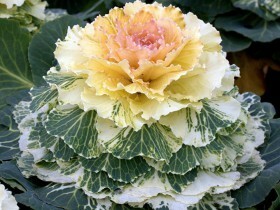 Decorative cabbage, with contrasting streaks. Ornamental variety with green edges. All content on this site SamDizajner.ru written specifically for Simdesigner, copying 1 in 1 strictly prohibited. 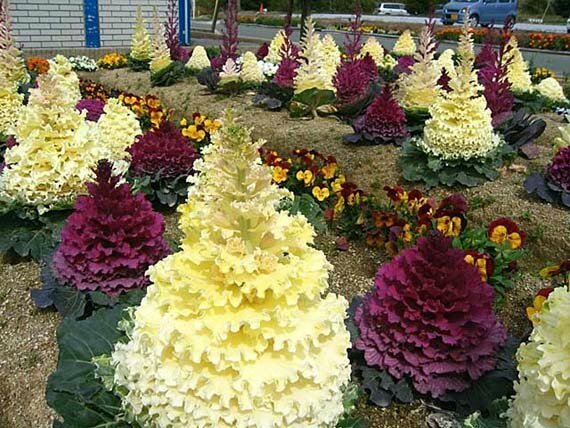 Reprint, full or partial rewriting of the article “Decorative cabbage – the main element of the flower beds”, possible, only when you specify the full, active link to the source.